The Whippet is probably most well known for being a race dog, as they can accelerate to their top speed faster than any other breed. However, they are becoming much more popular in the show ring, in agility competion, as family friends, and even in pop culture. Whippets are very intelligent, sometimes willful with a mind of their own, but they are so sweet and affectionate it is impossible to be mad. 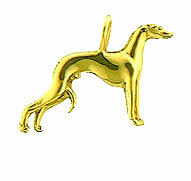 Enjoy your Whippet with this pendant of the him perfectly stacked in the ring. Ideal for a necklace or can be offered as a lapel pin or a tie tack.